View of the pattern printed on the interior. 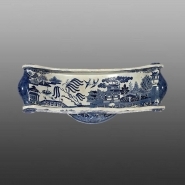 An earthenware cheese wheel printed in blue with the Standard Willow pattern. The molded spool-shaped ends are painted with a blue ground. Cheese wheels, sometimes referred to as cradles, were designed with their distinctive curved shape in order to hold an entire circular cheese on its side, so that wedge-shaped pieces could be cut from it.